So yes, I have been baking. I'm not usually that keen on banana bread, but we had a few rapidly-ripening bananas sitting in the kitchen and I didn't want them to go to waste. And I was totally over muffins. I had a quick flick through my Nigella books, for inspiration, before stumbling across this humble-looking banana bread recipe in How to be a Domestic Goddess. Nigella says that her banana bread is "fabulously easy", and is the type of recipe that anyone 'hesitant about baking should try'. Y'all will know I'm not hesitant about baking (hardly! 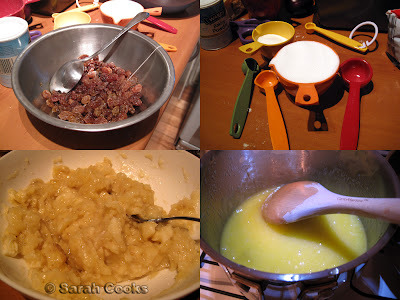 ), so the ease of the recipe was just further encouragement. 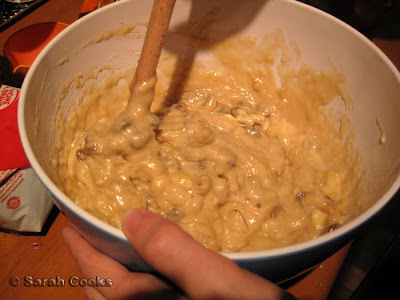 Nigella suggests soaking the sultanas in rum, but I had no rum, and wasn't about to buy a bottle just for a recipe! I instead steeped the sultanas in hot water with an English Breakfast tea bag for about 10 minutes. I was hoping I'd have some German Rum Aroma, but unfortunately I'd left it at my parents' place. I added a teaspoon of cinnamon instead. The rest of the recipe is simply a matter of mashing and stirring and melting and more stirring. Walnuts are listed as an optional ingredient, but I love them. One hour in the oven, and you're done! For some reason, my banana bread rose a lot higher, and looked more cakey than the picture in the book. Nigella's version, for some reason, is flat, paler in colour and has a foamy-looking top (i.e. cooked, but with lots of little air bubbles, like the foam on a well-made cappucino). I loved the rustic-looking crack down the top of the loaf, and the crusty crackly bits taste the best! I ate a slice on the first night, before (surprise surprise), slicing up the remainder thickly and freezing the slices. The bread is delicious and fragrant, and it freezes beautifully. I've been taking a slice (still frozen) to work, and toasting it in the sandwich press for morning tea. Toasting it like that defrosts the bread, re-crisps the edges and toasts the walnuts, making the whole slice as warm and as inviting as a fresh slice. Freshly baked banana bread, or even re-toasted frozen banana bread is fabulous, and way better than the greasy cold, depressingly glad-wrapped slices you get at cafes. Give it a go!! This is one of my favourite recipes - so delicious. Keeps for a long time too. I love it with Marsala and chopped dark chocolate added in. Delicious! I love this recipe too. I like the idea of toasting a slice - we have siliconised 'toaster bags' and I think they'd be good for that. 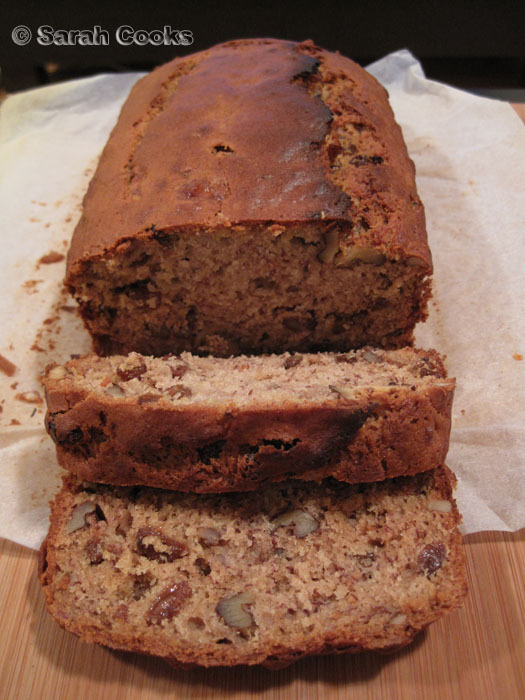 Mmmm great looking banana bread. I don't think I have ever added sultanas. I am sure it tasted great. Laura - great idea, I think choc chips would work really well too! Norm - Cool, I've never seen a siliconised toaster bag before! Carlos - thank-you! 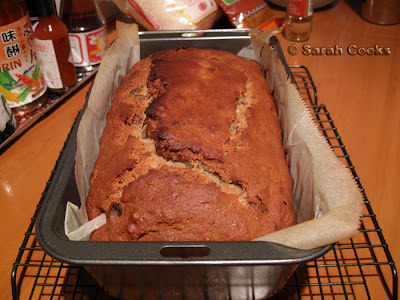 I don't always like sultanas but they worked really well in this bread. i generally alternate between baking banana bread and muffins - there's always an old banana lying around the house!